Billions of highly diverse and specialized immune cells work together to keep us healthy. LJI scientists are deciphering the molecular code that defines who these cells are and how they interact with each other, ushering in a new era of high-resolution immunoprofiling. The composition of an immune system varies not just from person to person, but over time—shifting as our health changes, as we encounter different viruses and bacteria, and as we age. Within that variability lies important clues to improving human health: The presence or absence of certain cells may hint at whether a person is at risk for heart disease, tell us how someone is likely to respond to an influenza vaccine, or suggest whether a new immunotherapy is the best way to treat their cancer. For now, many of those clues remain concealed within the immune system’s staggering complexity, but LJI researchers are accelerating the search. They are creating detailed profiles of the immune system, breaking it down into its constituent parts and examining its cells’ molecular makeup in health and disease. They are mapping out the genetic factors that drive the immune system’s variability and finding out which kinds of cells control infections and which ones fail. The knowledge they are uncovering is forming a roadmap for researchers worldwide probing the immune system’s role in disease. 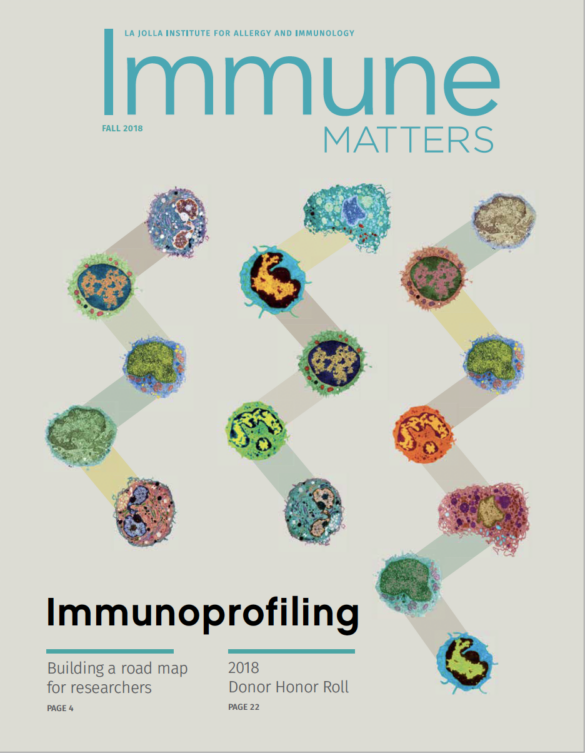 One of LJI’s major immunoprofiling projects is a deep analysis of 15 different types of immune cells led by Pandurangan Vijayanand, M.D., Ph.D., an Associate Professor in the Division of Vaccine Discovery. Dr. Vijayanand and his team are creating detailed molecular profiles of these cell types as they are found in each of the 100 healthy volunteers. The resource will be so vital to the research community that the National Institutes of Health is supporting its development with a $4 million grant. The team’s goal is to examine the consequences of genetic differences on the immune system and learn how that variability impacts our susceptibility to a range of diseases, from asthma and cancer to autoimmune disorders and infectious diseases. Genetic studies have tied specific variations in the genome to all of these conditions. Most occur in the largely uncharted DNA between genes, where subtle sequence variations can have profound effects on when, where, and how strongly genes are switched on. Without the kind of highresolution immunoprofiling taking place at LJI, most of these disease-associated genetic factors would remain mysterious: Scientists wouldn’t know which genes they affect or in which cell types they matter, making it difficult to sort out how they affect the function of the immune system. The massive, technology-driven immunoprofiling effort at LJI will make it much easier to interpret these genetic clues and bridge the gap to clinical advances. Dr. Vijayanand and his team are essentially creating an atlas that will lay out, for every cell type, which genes are affected by specific genetic variants. To do that, they have worked with LJI’s core facilities to measure the activity of every gene in each of the 15 cell types, for each of the 100 donated samples. Now, adding an additional layer of information, the team is mapping exactly where activity-modulating marks called histone modifications dot the genome in each cell type. That will help them to determine which genes are under the influence of each histone marker, and might hint at ways to modify gene activity to treat disease. Sorting 15 different types of cells out of each donor’s blood sample and analyzing them individually is an ambitious undertaking, but an essential one. For many years, researchers studied the immune system as if all of its parts behaved the same—but we know now that it is characterized by layer upon layer of complexity. 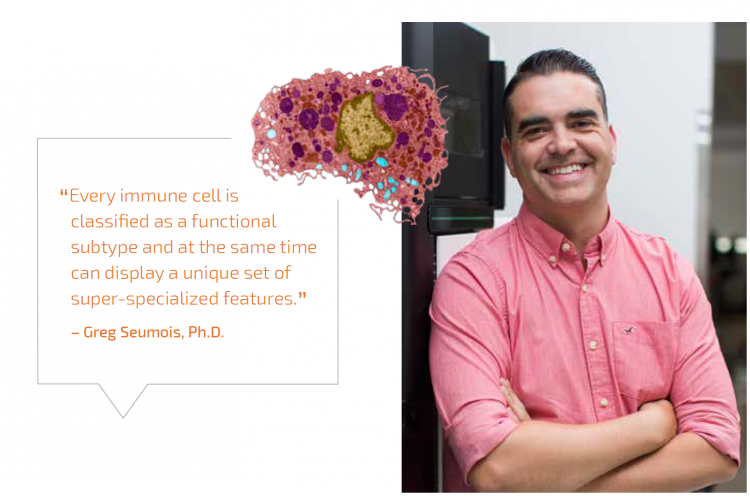 “Every immune cell is classified as a functional subtype and at the same time can display a unique set of superspecialized features,” says Greg Seumois, Ph.D., who directs LJI’s sequencing core facility and has overseen all the sequencing for the project. Consequently, a lot of information is lost when mixed populations of cells are analyzed together. This multilayered profiling is generating a staggering amount of data, and making sense of it all requires both computational expertise and deep knowledge of the immune system. That analysis, led by computational biologist Bjoern Peters, Ph.D., also a Professor in the Vaccine Discovery Division, is already paying off, revealing key distinctions between cell types and pointing the team to genes worthy of deeper investigation. Genetic variation impacts the activity of about 10,000 of the 22,000 genes that are switched on in immune cells, the team has found—but about half of these are affected in just one of the 15 cell types. With gene activity profiles complete for the first 15 cell types, the team is already expanding the scope of their project—returning to the frozen stocks prepared from the blood samples to analyze additional cell types and test how cells’ gene activity changes under different conditions. They’re also starting to follow up on leads that have emerged from their data—testing the function of genes whose activity patterns sparked their curiosity or suggested a role in disease. But they have uncovered such a wealth of information, it’s going to require a lot of people with a wide range of expertise to take advantage of it all. “We are generating a huge resource that the entire world will have access to. The challenge is to try to make sense of all this information. Understanding the basic biological processes will ultimately help us to find a cure for disease,” says Dr. Seumois. All of the cell profiles are freely available to the research community, and word of the resource is beginning to spread. Dr. Schmiedel says when he first tells people about the project they are impressed by the sheer volume of data LJI has produced—and then they quickly begin seeking specific information about the genes or diseases they study in their own labs. That’s exactly what the team had hoped. Ultimately, the data will be accessible through an interactive database that Dr. Peters is developing so users can easily search by gene or cell type. “We’ll give people this information and they can take it from there,” Schmiedel says. While Dr. Vijayanand’s team profiles the cells of healthy individuals, LJI researchers are also taking a similarly comprehensive approach to figuring out which features of the immune system are critical for protecting the body against specific pathogens. Since 2014, teams led by Dr. Peters and Alessandro Sette, Dr. Biol. Sci., head of the Division of Vaccine Discovery, have been focusing on two pathogens that have major impacts on global health: the mosquito-borne dengue virus and Mycobacterium tuberculosis. Hundreds of millions of people are infected by dengue and tuberculosis every year. Drs. Sette and Peters want to know what’s different about the immune systems of people who control these infections compared to those for whom the same microbes cause life-threatening illness. As one of eight centers collaborating to characterize the immune system through the nationwide Human Immunology Project Consortium (HIPC), LJI has received $18 million of support from the National Institute of Allergy and Infectious Disease to find out. The strategy for these teams is to first isolate the subsets of T cells that recognize dengue and tuberculosis from the blood of people who have been exposed, either through vaccination or natural infection. Then they create detailed profiles of those cells, comprehensively surveying their gene activity and determining whether key protein markers are present on their surfaces. Then they sift through the data, comparing the immune responses of various groups. What’s different about dengue-detecting T cells in people who develop natural immunity to the virus after a few infections, as compared to people whose infection leads to hemorrhagic fever, the severe form of the disease, for example? As these analyses begin to reveal the hallmarks of effective immune responses, that information will guide the development and testing of new vaccines. Blood samples for the dengue and tuberculosis projects come to LJI from around the world, and since 2014, LJI’s sequencing core facility has analyzed more than 4,000 of them. It’s important that diverse groups of people are represented in the analysis because so many factors influence the makeup and effectiveness of the immune system. Some subsets of T cells may be well equipped to fight strains of tuberculosis that are prevalent in Nicaragua, for example, but do little to protect someone who becomes infected in Sweden. “We want to make sure what we see is reproducible in different geographical locations, because we don’t want to make a vaccine that works only in South America but not in Africa or vice versa,” Dr. Sette says. As with the profiles of healthy immune systems, the biggest challenge these teams face may be taking advantage of all the data they are producing. “It’s really a flood,” Dr. Peters says. “Right now, we have too many interesting things to follow up on.” But here too, data sharing is a priority, and the knowledge coming out of LJI will spur progress in labs around the world. LJI researchers hope their pioneering efforts will spur more immunoprofiling, too.